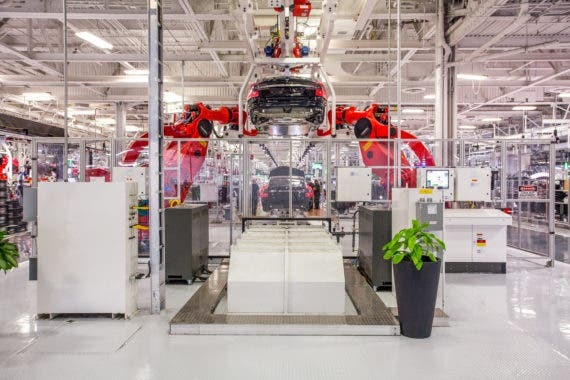 According to a report in the Wall Street Journal, Tesla is holding talks with two German states — Rhineland-Palatinate and the Saarland — about building a new factory in that country. The news follows a tweet by Elon Musk on June 19 that suggested Germany was a “leading choice” for a new European factory. It is generally believed any new manufacturing facility would combine battery production with vehicle manufacturing in one location. Both German states are near the border between Germany and France and quite near the so-called Benelux countries of Belgium, Netherlands, and Luxembourg. And there’s another factor to consider. The city of Prüm is located in the state of Rhineland-Palatinate and Prūm just happens to be where Grohmann Engineering — the engineering company Tesla purchased recently — is located. German newspaper Frankfurter Algemeine says representatives of Tesla have also been in discussions with officials from the Netherlands about possibly building a factory in that country. Tesla already has its European headquarters and an assembly facility in the Dutch city of Tilburg. Tesla declined to offer a comment on the WSJ story to the German newspaper. As CleanTechnica contributor Kurt Lowder wrote in June, Germany prides itself on having the best engineers in the world, thanks in part to an educational system that nourishes and encourages students with a talent for engineering. Germany does not follow the American model of emphasizing a liberal arts agenda for all. It begins distinguishing students with an aptitude for science, technology, engineering, or math at an early age and making sure they get the education they need to become valuable members of the workforce upon graduation. Few young Germans experience the heartbreak of having a degree in English or sociology, a crushing load of college debt, and being unemployable because they have none of the skills companies are looking for. Germany also is a leader in renewable energy, a feature that Musk and Tesla should find appealing. Its Gigafactory in Nevada was designed from the ground up to operate on 100% renewable energy. It would be a plus to know it is operating in an environment that has similar values to its own. While the financial world spins itself into a dither about whether or not Tesla will ever be profitable, especially ahead of its Q2 earnings call later this week, Tesla is forging ahead with plans to keep disrupting the auto industry until the auto industry does something about it. Tesla has recently signed an agreement with the city of Shanghai for a factory in China that should begin producing automobiles within two years. Where will the money come from to build all these new production facilities? In the world of Tesla, you either believe in Elon or you don’t. There is no in between. Only Elon Musk knows for sure and he’s not saying. Well, perhaps he doesn’t even know yet. Stay tuned. The story of Tesla, which will be a required course in business schools in the future, is still being written.